A new rocket pack developed by Russian engineers will help cosmonauts move freely and work in space, and in case of danger will automatically return them to the station or spacecraft. The Zvezda research and production enterprise, which for many years has manufactured space suits and unique emergency equipment for pilots and astronauts, is conducting development work on a Russian rocket pack called Safer. This is a device that will return a cosmonaut to the spaceship or station if he suddenly moves a dangerous distance away from the craft during a spacewalk. According to experts, by the end of the year the capabilities of the rocket pack prototype will be demonstrated at Zvezda’s experimental test rig. Lighter and more perfected than previous similar units, it looks like an ordinary backpack that is attached to the Orlan-MK spacesuit. Inside are 16 jet engines and a special rod with control panels. According to experts, in a stressful situation, when a cosmonaut moves away from the station, it is difficult to expect that he will be able to quickly navigate in space, correctly calculate his flight path and cope with the complex Safer control system. The device resolves this problem by automatically bringing cosmonauts to the station’s handrails at the push of a button. Essentially the idea is not new, neither is it new for Zvezda. In the USSR, a “space motorcycle” for moving and maneuvering cosmonautswas also developed for the Mir station and the Buran spaceship. In 1990 it was tested by cosmonauts Alexander Serebrov and Alexander Victorenko. The setting allowed the cosmonautsto potentially move 60 meters away from the station. At that time, the device for moving in space turned out bulky, weighing almost 400 kilograms, and its compressed air engines could provide only six hours of battery operation. The first working "star bike" to fly around the Mir station was tested by Alexander Serebrov, cosmonaut and Hero of the Soviet Union. He rode on the vehicle in space for almost 40 minutes, successfully taking off from the station and returning to “park” on it. “It turns out that in zero gravity the friction coefficient is quite different. I was supposed to fly to a distance of 25 meters, but flew 30 meters away. At the space flight operations center, the tension was awful: ‘It’s going to break away!’ I felt a crystal silence all around me,” recalls Serebrov. Once he almost flew off into space due to a loose handrail. As the cosmonauttold RG, he was saved by the fact that he had time to secure himself to the station. "We had the opportunity to fly like birds in the clouds," says Hero of the Soviet Union, cosmonautAlexander Victorenko. 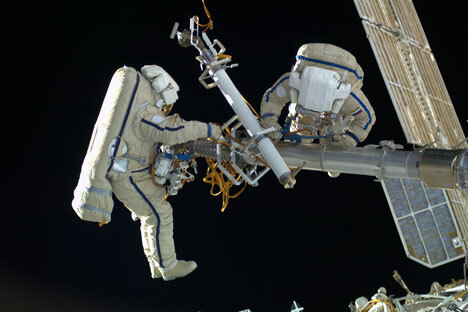 As part of the “lifeguard” test program, just one spacewalk was scheduled, successfully carried out by Serebrov. There were no plans for a second, but the cosmonautstook a chance and begged the research and development enterprise to permit a second foray into space. This time Victorenko had to ride the motorcycle. Testing of the space motorcycle in the early 1990s was successful. With it, you could also move cargo around in space. A cosmonautcould even repair satellites on this vehicle. It should be noted that Soviet and American engineers had previously created several prototypes of rocket packs for cosmonauts, some of which were tested in open space. The first time a hand-held maneuvering device was tested in orbit was by Gemini 4 astronaut Edward White. After that, American experts created an astronaut maneuvering unit, which was tested in 1984. In 1994, the American shuttle mission tested a module for rescue during spacewalks. And now, with the creation of the Safer rocket pack, the quest to develop a unit that allows astronauts and cosmonauts the necessary mobility and security to carry out exterior maintenance work on spacecraft and make more extended forays into open space is one step closer to becoming a reality. Russia’s cosmonautsare enthusiastic about the prospect of a Russian-developed rocket pack that will guarantee their safety in a vacuum, and are waiting keenly for the opportunity to use the unit to work on the exterior of the International Space Station.